The Alternative Giving Market of the Palouse (AGMP) was created by a small group of individuals with a desire to “give residents of the Palouse meaningful alternatives to holiday gift giving and opportunities to support local non-profits.” Fast-forward seven years and the AGMP has raised a total of $126,558 for non-profit organizations across the Palouse! The project has no paid staff, and is entirely run by volunteers. It’s truly amazing what this group of special individuals have been able to do for our communities. How it works is simple: start your holiday shopping this Thursday December 1 between 4:00 – 8:00pm at the 1912 Center, 412 E. Third Street in Moscow, and visit tables representing (32) non-profit organizations from the Palouse, including Friends of the Clearwater. Then simply tell the volunteers working the event what card you wish to purchase, and they will help you check out. All proceeds from the card goes directly to that organization, and then it’s up to you to mail the card to your friend or loved one! $5.00 Protect watersheds and water quality in the Clearwater Basin. $10.00 Protect old growth forests from being logged in the Clearwater Basin. $10.00 Protect wolverine habitat in the Clearwater Basin. $20.00 Keep megaloads from traveling on Highway 12 in the Clearwater Basin. $ (Any amount) Remove the four lower Snake River dams and restore wild salmon populations to the Clearwater Basin. If you cannot make it this Thursday December 1st between 4:00 – 8:00pm at the 1912 Center, 412 E. Third Street in Moscow, you have options! You can do your gift-giving online until December 10. Click here. 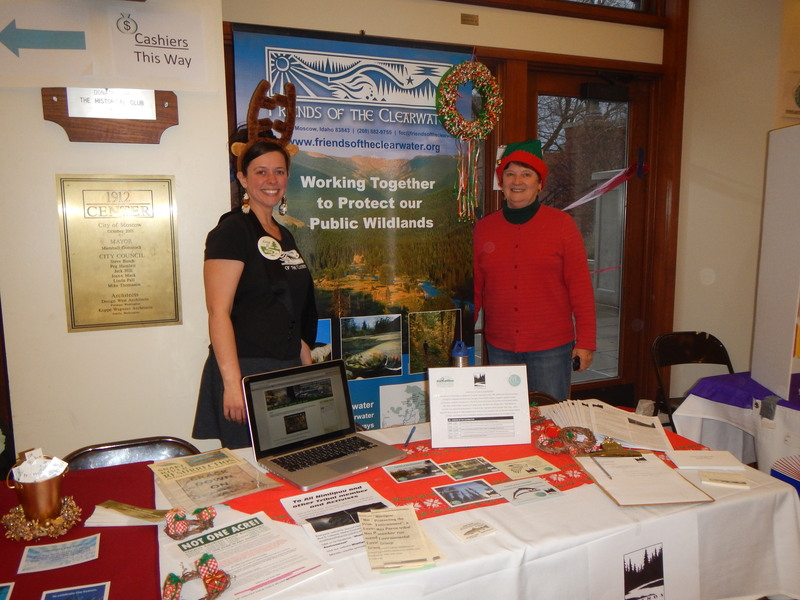 The AGMP will also be featured on Saturday December 3rd and 10th at the 1912 Center Winter Market from 10:00 – 2:00pm, and at the Palouse Mall in Moscow on the same dates between 12:00 – 5:00pm. FOC is extremely appreciative for the opportunity to participate in the 8th Annual Alternative Giving Market of the Palouse. Please consider supporting us this holiday season through this charitable program. You don’t have to live on the Palouse to participate!